By default, there is only one Master Catalog in the OroCommerce application. To customize this catalog, you can add or delete a category, creating a group of products and linking it to the corresponding web catalog. Navigate to Products > Master Catalog. Title — A meaningful name for the category. Click the Translations icon to provide spelling for different languages. Click the Default Language icon to return to the single-language view. Description — A short and/or a long description of the category you are creating. Click the Translations icon to provide spelling for different languages. Click the Default Language icon to return to the single-language view. URL Slug — A web address generated automatically once the title of the category is defined. It is used to build a human-readable URL for the product page in the storefront. Click the Translations icon to provide spelling for different languages. Click the Default Language icon to return to the single-language view. Small Image — An image used to represent the category in the storefront. Large Image — An image reserved for customisation purposes. In the Products section, select the items for the category you are creating. Use available filters to narrow down your search and speed up the selection of the necessary product items. Unit Of Quantity A product unit that is shown by default in the product details page in the storefront. Available options are each, hour, item, kilogram, piece, set, and Parent Category. The latter is used to refer to the same product quantity unit configured for the corresponding parent category. Precision An acceptable value (number of digits after the decimal point) for the quantity that a user may order or add into the shopping list. Items and sets are usually whole numbers, and units like kilograms may get precision of 2 to allow buying a custom volume (e.g. 0.5 kg). Inventory Status This setting enables you to define and modify status information for the stock of the product. This setting defines the method for inventory management. 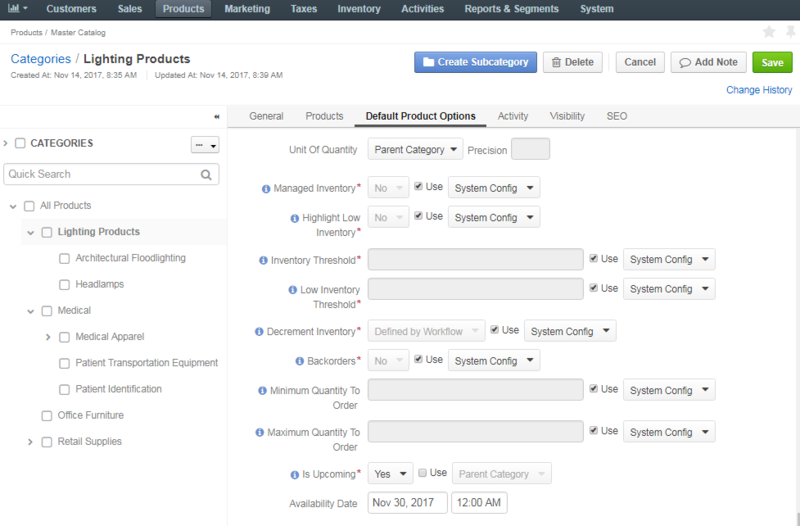 With Use category defaults, the product’s Manage Inventory inherits the setting selected for the product’s parent category. With Use system config, the product uses the system configuration setting. Selecting Yes enables interactive updates based on the product inventory information from the Inventory > Warehouses section. Selecting No disables connection to the inventory, and uses the static Inventory Status value. 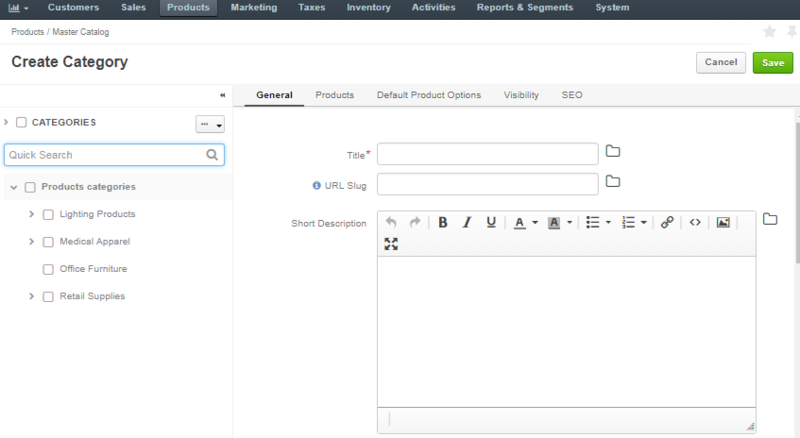 Highlight Low Inventory This option defines if low inventory for products is displayed in the storefront. Inventory Threshold A minimum quantity of the product that is treated as In stock. When a product quantity drops below this value, the product inventory status becomes Out Of Stock. Low Inventory Threshold The minimum stock level defined for the product. Reaching the defined level will trigger a warning message to the buyer in the storefront. Backorders A flag that indicates whether OroCommerce accepts backorders. When set to Yes, buyers and sales people can order products in the quantities that are not currently available in the warehouses. The remaining portion of the order will be sustained until the product gets back in stock. A flag that indicates whether OroCommerce decrements inventory upon order. When both Decrement Inventory and Backorders are enabled, a product quantity may become negative. Minimum Quantity to Order A minimum quantity that a buyer or sales person can claim in the RFQ, customer order, quote, or a shopping list. Maximum Quantity to Order A maximum quantity that a buyer or sales person can claim in the RFQ, customer order, quote, or a shopping list. Is Upcoming This option informs a customer that the product of the selected category is not in stock currently, but will be available later. When set to Yes, additional Availability Date is displayed. To remove the upcoming products label, set the option to No or customize the required behavior in the system configuration. Availability Date The date which indicates the exact date and time since when the selected product will be available in stock. The Activity section displays all the activities available for the selected category, such as call, task, email, note, or calendar event. You can use filters to select any activity type and a date of its implementation. In the Visibility section, you can set a visibility restriction for the category. Parent Category — Inherit the configuration from the parent category. Config — Inherit the category visibility settings customized in the system configuration menu. Hidden — The category will be hidden from the storefront. Visible — The category will be shown in the storefront. In the SEO section, fill in the following details to help search engines show your master catalog content to the relevant audience. 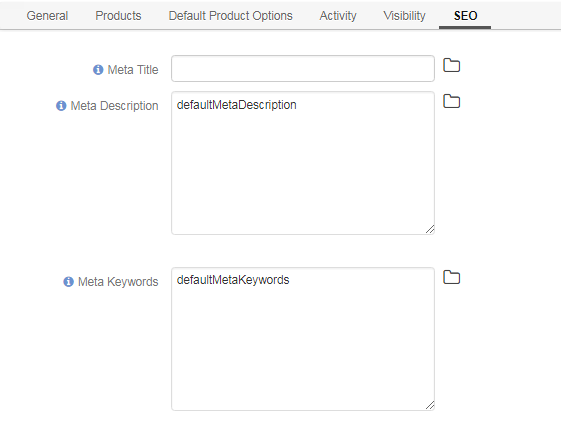 Meta Keywords — Enter the meta keywords for the product. A meta keyword is a specific type of a meta tag that appears in the HTML code of a web page and helps tell search engines what the topic of the page is. Meta Title — Enter the meta title for the product. A meta title is what is seen by search engine users and helps a search engine to index the page. Meta Description — Enter the meta description for the product. A meta description summarizes a page content. Search engines show a meta description in search results if they see the searched phrase in the description. Click the Translations icon to provide spelling for different languages. Click the Default Language icon to return to the single-language view.